A highly versatile canister vacuum which works well of bare floors as well as carpets. 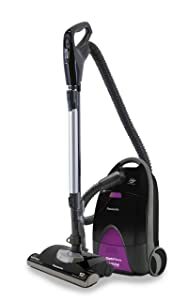 The Panasonic MC CG937 OptiFlow Canister Vacuum Cleaner review brings to you the strong as well as the weak points of this vacuum. It is a highly versatile vac which can work really well on hardwood floors and various types of carpets. It comes with a combination of adjustments and accessories which make deep cleaning an easy task. At an affordable, the MC-CG937 is a bagged vacuum which has some great features which make it popular among many users. It uses the Optiflow technology which uses double wall construction and a unique venting system. This means that the airflow is more than what is there in a standard unit. Canister vacuums are usually considered a little difficult to handle when compared to upright vacuums. This is because of the additional canister which has to be dragged around along with the wand. The Panasonic MC-CG937 somewhat faces the same kind of problem. At 23 pounds, it is a quite light vacuum to carry around the house. This vacuum is not the best when it comes to cleaning stairs. This is mainly because of its weight. However, when we talk about moving it around on plain floor, its manoeuvrability is better than many other vacuums of the same weight. It rolls easily when you try to move it around when the vacuum is in use. The 14 inch cleaning path and a 6-foot hose make it easy to clean the house without making too many rounds. Reaching the ceiling is not very difficult either unless you have a very high ceiling. The power cord is 24 feet long which makes cleaning a smooth task without the users having to stop and change the power outlet very frequently. The long power cord saves you the hassle of dealing with tangled wiring because it retracts automatically into the canister. This also make storage extremely easy for this canister vacuum. The HEPA filtration allows for an improved air quality with lesser allergens. Onboard storage for the attachments means that you will not have to go to the storage area for getting the accessories. This also ensures that the accessories are kept safe and will not be misplaced. The switch for brushroll activation is located on the handle itself so it is easy for users to switch from one type of flooring to another. 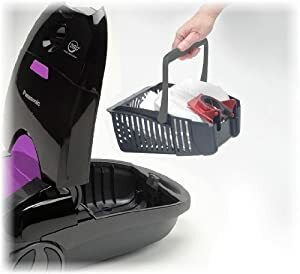 Unlike the other canisters, this vacuum includes a removable bag caddy. This makes changing and disposing bags very easy for this bagged vacuum. You can lift the bag caddy out of the canister easily. When you buy this vacuum, two HEPA bags are included in the package. You will be able to buy replacement bags on Amazon. The genuine bags which are designed specifically for this vac are a little expensive but they have a larger capacity. This means you end up with fewer replacements. We found the MC-CG937 to do exceptionally well on a variety of floorings. You have the ability to change the suction for different types of fabrics. When you are cleaning delicate fabrics, you can reduce the suction and you can power it up when cleaning tougher fabrics like carpets. The vacuum is powered by a 12 amp motor and it is designed to work well on bare floors as well as carpets. The brush roll activation switch located on the handle allows you to choose between powering the canister motor only and powering both the canister and the power nozzle motors. You can choose from four different carpet heights in order to ensure that your carpet is cleaned appropriately. A small pedal on the vac allows you to choose between the four heights and an indicator will let you know which height your vac is currently set to. The hose connection has a swivel device which allows the hose to turn without moving the canister. We found this feature to be extremely helpful when you are cleaning a small area. We did find it a little tricky to get the hose locked on to the canister. The on-board tools can help you with deep cleaning. And the telescopic wand is adjustable so that users can set them according to their height. 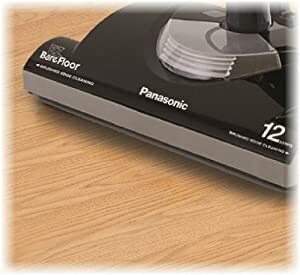 The Panasonic MC-CG937 OptiFlow Canister Vacuum Cleaner review details the features of the vacuum so that you can figure if it will be suitable for your home. The OptiFlow technology makes it great and it provides a strong suction. The ability to change the suction is also helpful for cleaning different types of fabrics.